Introduction. Taxonomy, Agronomy and Botanical Aspects of Phyllanthus. Pharmacopoeial Standards and Phytochemistry. Pharmacology of Phyllanthus spp. 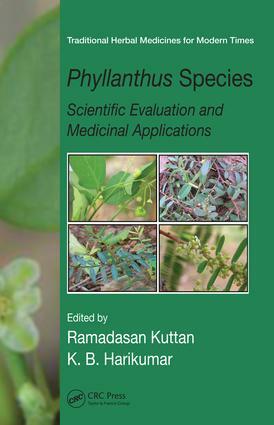 Indian Formulations containing Phyllanthus spp. with Other Plants. Miscellaneous Aspects Phyllanthus. K. B. Harikumar, Ph.D., received his bachelor's and master's degrees in biochemistry from Nagpur University in India. His doctoral research on cancer chemoprevention by natural products was conducted under the direction of Dr. Ramadasan Kuttan at Amala Cancer Research Center, affiliated with Mahatma Gandhi University at Kottayam in India. Presently, he is a postdoctoral associate in the Department of Biochemistry and Molecular Biology at Virginia Commonwealth University, Richmond, Virginia. He has over 40 peer-reviewed publications and several book chapters to his credit. His major research focuses are cancer chemoprevention, ubiquitination and nuclear factor kappa B signaling, and the role of bioactive lipids in cell signaling.